K2 Gyms located in Bridgend, South Wales is a state of the art open gym across 2 floors, with top of the range cardio equipment and weights. The fully equipped functional area and studio is used for over 50 classes per week including spinning, circuits, pilates and many more. K2 Gyms had just 1 phone line and regularly used a card machine to process payments. This meant when the machine was in use, the phone line would be occupied – customers calling at that time would hear an engaged tone. According to research, a staggering 85% of potential customers will not call back if their call is not answered the first time and 75% of those people will not leave a voicemail. Productivity wasn’t being maximised therefore fast broadband was essential for customer payments and processing transactions. Additional handsets were required to improve operations and customer service. 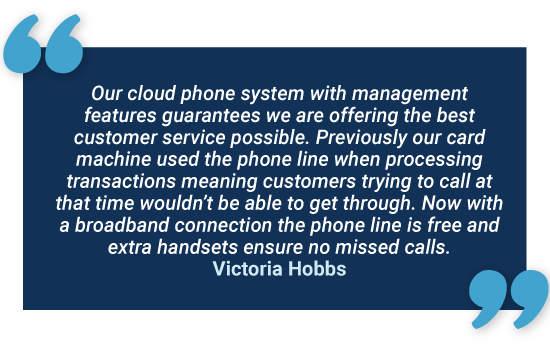 The company required a modern, futureproof telecom solution to improve their day to day operations to ensure no lost business. The gym will be able to efficiently make bookings, process transactions and increase their social media presence. Installed and programmed in different areas of the premise: reception, café and gym to ensure improved efficiency and no missed calls. Research confirms that callers who hear music and messages while waiting are less likely to hang up. Combined lines, calls and broadband under one supplier and one bill.